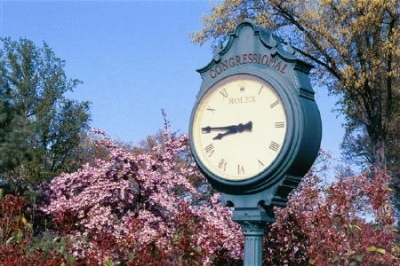 Time stands still at Congressional Country Club. BETHESDA, MD -- Time standing still. Albert Einstein proved that it's not possible, yet some places still seem to render the passing of time virtually meaningless � locations where the feel for the past transcends time and space, transporting wonderfully bewildered visitors back to grandest days of yesteryear. Such is the feeling members (and their guests) get every time they set foot onto the grounds at Congressional Country Club in Bethesda, Maryland. The club was founded in the early 1920's by the 'who's who' of Washington DC's political elite at the time, as a place to 'escape' the turbulent pressures of governing the nation, allowing them to get away from it all for an afternoon or a day. The club's certainly evolved over the years, with its membership moving away from the central political power base � more towards your traditional golf club members, mainly professional families and colleagues. Politicians can no longer call and expect to just show up uninvited, but the club's reputation remains as a place where powerful folks gather to play the grand and ancient game of golf. The 501 yard, par five 7th hole may seem approachable in two, but if you're short, pitching up the slope will be quite a challenge. John Lyberger, Congressional Club's Director of Golf, explains: "Congressional was founded primarily as a playground for the politicians of Washington, at a time when there essentially were only dirt roads leading out to the countryside. It took a while to travel this far out in those days, so it really was like making a trip to the country." He continues, "After World War II, the club really became more of a place where families gathered and the membership included all kinds of different employment backgrounds. But even to this day, I'll get calls from Congressional offices asking how to make tee times for a visiting constituent who wants to play golf here. So there's still a bit of a misconception that Congressional is a place where politicians or their friends can just show up and play � but I have to explain that it's a private club." Though the club offers a wide range of activities and social functions, there's little disagreement that golf was and is the center of its universe, with 36 of the most storied links you'll find in the Capital area � or anywhere else for that matter. Greenside at the par five 14th hole -- well protected by Arthur Hills' reconstructed bunkers and a collection area to the right. Congressional's Blue Course has received the most notoriety, having hosted two United States Opens, a Senior US Open, a PGA Championship and the area's annual PGA Tour stop, the Kemper Open (now the Capital Open, played at TPC Avenel, just down the road) for seven years. But the Gold Course has also received some attention lately, of the upgrade variety. It seems the course needed a bit of a facelift to allow it to compete for members' favor, and course architect Arthur Hills, who's renovated a dozen or so Washington area private clubs, was the perfect man for the job. Hills tells the story: "Though the Gold Course contained half of the club's original holes, it was probably viewed as the Cinderella of the two courses there. The membership seemed to favor the Blue Course, and when guests came in, they always wanted to play that course � so there was a disproportionate amount of play on the Blue Course." As Hills alluded to, the Club's original 18 holes were built in the 1924, designed by Gilded Age course architect Devereux Emmet. After WW II, a third nine was added (1957), designed by Robert Trent Jones, who also reworked what became the Blue Course's front nine. The Gold Course's back nine was added in 1977, designed by George and Tom Fazio, then tinkered with over the years by different architects, including Ed Ault of Ault, Clark & Associates. Though many trees were taken out, there're still plenty left to provide shade and frame the golf holes. Here, the par three 11th hole. 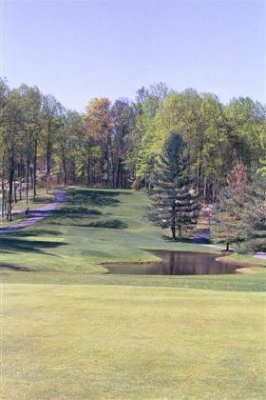 The 'inner' nine (nine of the original 1924 holes, and currently holes 1-5 and 15-18 of the Gold) was combined with the new 'outer nine' across Persimmon Tree Road (holes 6-14) to constitute the Gold Course. And though it hardly can be claimed that the Gold layout fell on hard times, Hills says when he first arrived in 2000, some changes were definitely in order. "The biggest problem we saw was the encroachment of mature trees on the Gold course. It obviously had changed quite a bit in the twenty-plus years that the outer nine had been in existence, and even the inner nine had several holes where trees were causing the turf conditions and playability to suffer. So the first thing we did was take out about a thousand trees, so the members didn't have to play single file down the fairways," Hills mused. The improvements didn't stop with arboreal subtractions. Overall playability was addressed, too: "We also did some extensive fairway grading on a few holes, replaced all the tees, reworked all the bunker complexes, installed an irrigation system and changed the fairway grass from rye to bentgrass. It may sound like a lot � and I'm not saying that there wasn't a lot of sweat that went into the project, but it was all accomplished on a very reasonable budget," Hills said. Looking down towards the 12th green, you'll grasp the park-like feel of the Gold Course's outer nine. He continues, "We were extremely pleased with the way it turned out � drastically improving the course, while working within a strict budget. Despite all the trees we took out, the course is still very peaceful and shady. And as you can see, there are still plenty out there." That's no exaggeration. 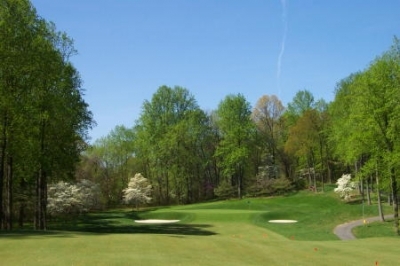 It's an amazing sensation to make a trip around the course, because it feels like you're in a park in the middle of the country � not in a very upscale suburban neighborhood a mile or so from the Washington beltway. There obviously was a great deal of care taken to preserve the rural ambiance of the club, truly a place to get away for a time, which just seems to fit the theme of the place. And probably because the Blue Course has hosted two national championships (the last being the 1997 US Open), it has the reputation of being the more difficult of the two layouts. 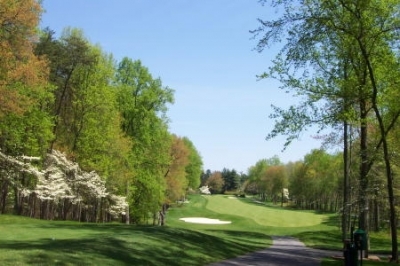 Not so, according to Lyberger: "After the Gold's renovation, it now plays just as difficult for the better players as the Blue Course does � and that provides quite a great option for the members, to choose which course to play." From the 8th fairway, look back at the new teeing area. "The Gold's a course where you really need to drive the golf ball in play, and you've got to get it out there a fair distance from the back tees to put yourself in position to go at the greens. 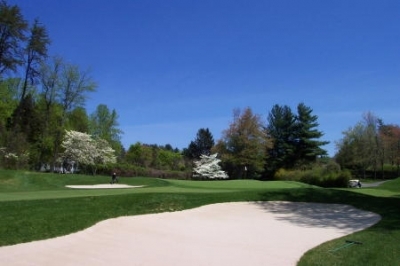 It's a great challenge for the lower handicapper from the tips, but with Art's new tee complexes, you can always move forward to find a much more friendly golf course for people new to the game, or for all types of players," Lyberger adds. According to Lyberger, there are other ways that Hills made it easier for people to play the newly redone course: "Arthur was also conscious of providing very subtle access and egress to the greens and fairways on the Gold Course. There're really only a couple areas where you'll have to go up and down a hill to get where you're going. For the handicapped or disabled golfer, he's done a great job in recognizing that access and egress is important." The different teeing options and improved convenience being another enhancement over the prior Gold setup. And to make sure things remain at a superior level, Hills' continued involvement is assured: "When we signed Arthur Hills to come in to make the improvements, we put a clause in the contract that requires us to run any potential changes we're considering through him. We contact him on a yearly basis as a retainer to basically come in and offer suggestions so we can maintain the integrity of the golf course and the design that he intended," Lyberger said. According to Hills, there's a lot more room to the right off the tee of the par five 14th hole, having taken out quite a lot of trees. In other words, there's no chance 'Cinderella' will be staying home from the ball, needing a makeover (at least in a major way) again in the coming years. Looking at some highlight holes, you need go no farther than the first tee to recognize the quality of what awaits you. 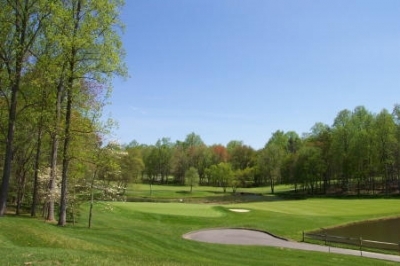 Set on a hill near the clubhouse, the look down includes a glance to the right of the par three 18th hole, as well as a wide first fairway to your center that doglegs left towards the green. Lyberger talks about the first hole: "I think the opening hole is much better than it used to be. You used to hit it straight out and the ball would roll to the bottom of the slope, leaving a blind shot coming in. Now, they've leveled out the plateau, so you can drive it out there and have a better view of the shot left to the green. It's still a difficult approach (180-90 yards), but it's a much more enjoyable opening to the round." Rays of sun overlook the clubhouse, as another day begins at Congressional Country Club. Three is a terrific par three, playing 221 yards (back tee) from an elevated tee, to a green protected by a closely mowed collection area to the right, and a large, deepened bunker on the left. The green slopes right to left, so if you miss right off the tee, you're in for a pretty delicate chip. Eight is one of the finest par fours you'll ever come across. Hills describes how it was improved in the new scheme of things: "Number eight was one of the holes where we added some length, and built a beautiful, elevated back tee across the pond. The routing was already pretty good on that hole, and by adding maybe 40 extra yards (up to 461 yards from the back tee), it became a tremendous hole. We also cleared out a bunch of trees on the right side, so not only can you see the hole better, it's more playable, too." 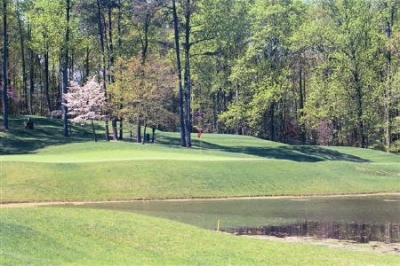 Eleven is a very attractive par three, playing 190 yards over a pond. There isn't a single bunker on the hole, but if you miss short, the ball will most likely trickle down a shaved slope to the water. Twelve is another fantastic par four. Rated the toughest hole on the back nine, you'll tee off to a nicely defined fairway that doglegs left. If you've got a draw swing in the bag, now's the time to use it, as a gentle slope will shorten the hole considerably if you can curve it around the corner. A mid to short iron approach awaits from the fairway. Water guards right-hand pin positions, and a new bunker protects short-left. The round concludes with a completely redone 18th hole � 204 yards over water to a green that's perched right on the edge. Bunkers guard left and long � but looking down, there's an awful lot of air between your ball and the green. Quite a nerve tester to finish up. All in all, the changes Hills made to the timeless classic Gold Course are becoming more and more seamless as the days pass by. What exists is a very beautiful, playable, enjoyable golf course. After experiencing it, you'll see that time really can stand still � and perhaps even move forward at the same time. 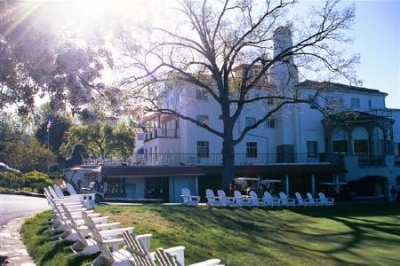 *Editor's Note: Congressional Country Club is a private club � play for members and their guests only. Our thanks to Assistant Professionals Jim Schouller, Jr. and John Blair IV, for showing us the course. GPS System on carts; large practice range, practice putting greens, short-game practice area, including a bunker. Full locker room facilities. Unrestricted walking, with caddies available. Other club activities include tennis and swimming.